Fundraiser by War Resisters Support Campaign : Let Them Stay! U.S. Iraq War resisters who sought refuge in Canada rather than participate in an illegal and immoral war have been fighting for a decade or more to win status in this country. The majority of Canadians support allowing U.S. Iraq war resisters to remain in Canada. This support has remained steady since the first war resisters arrived. 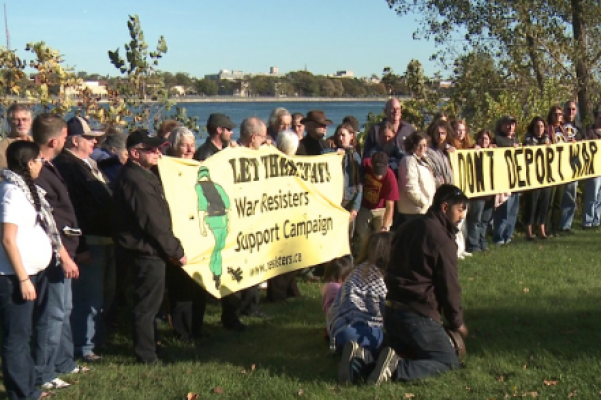 The War Resisters Support Campaign is organizing to make sure that the Liberal government acts quickly to resolve their cases and let them stay. To do this, we need your support. Many Canadians have written to the Prime Minister, the Minister of Immigration and their own MP. This is vital, as it shows the broad support for these courageous individuals. But we also need financial resources to continue this fight. We hope you will give generously, as you have in the past, and help us Let Them Stay! Thank you for your ongoing solidarity and support! We wish to say a huge, heartfelt THANK YOU to everyone who has donated to the War Resisters Support Campaign during this crisis, whether through this GoFundMe or by sending a cheque. Your donations are making a huge difference. We've had some success in court, and some of the war resister families at greatest risk have won a bit of breathing room. At the same time, we are fighting several ongoing legal challenges to keep U.S. Iraq War resisters safe in Canada. And every dollar we receive strengthens our ability to do that. Thank you for your trust, your solidarity, and your generosity! Greetings supporters of peace and the right of conscience! Please visit our website to read statements by U.S. war resisters in Canada, and to sign a letter to Chris Alexander, Ministers of Citizenship and Immigration, and Steven Blaney, Minister of Public Safety. Read an essay by a U.S. war resister in Canada published in NOW Magazine: "Is this the war you truly want for Canadians?”. Thank you so very much to all our generous donors! We really cannot thank you enough for helping us in this time of crisis. We have been extremely busy working on a great many things that are needed to help keep U.S. war resisters safe in Canada. Our fundraising is going well, but it is an ongoing challenge, and a dire one. You urge you to circulate this link with your own networks: http://gofundme.com/letthemstay. We will also contact you soon with another opportunity to renew your ongoing support. The weather makes travel a bit difficult but your showing of "National Bird" is a great idea. Can't make the dinner on the 12th but here is something for the cause. Continuing on with the struggle against US militarism.